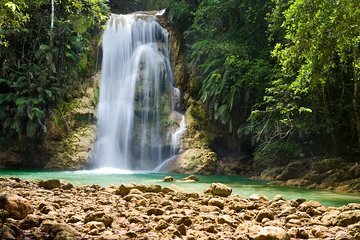 Deje atrás el bullicioso Puerto Plata por un día disfrutando de las playas de polvo, las montañas cubiertas de selva y las cascadas ocultas de la espectacular Península de Samaná. Embárquese en un viaje estilo safari a Rancho Aventuras, donde navegará a caballo por los bosques tropicales del Parque Nacional El Limón y tendrá la oportunidad de nadar en la refrescante piscina de la cascada de El Limón. Después de un almuerzo buffet dominicano, navegue a Cayo Levantado para descansar sobre sus arenas blancas perladas, nadar en sus aguas turquesas y tomar varias piña coladas (costo propio). Incluye transporte de ida y vuelta en autocar. Aprende sobre la historia y la cultura de la región con un guía. Long tour! But worth it. It took about 3-4 hours to get from Puerto Plata to Semana. They make bathroom stops along the way to Semana. We went to the mountain side area and were provided a variety of things to taste and try like fruit, coffee, cocoa, sweet potatoes, sugar, honey and tea. Everything they gave us was delicious. The people there were informative, warm and kind. The tour guide was really informative about the different things we were being introduced to. We took a jitney truck up the mountainside which was cool. At this location you are able to buy things from them and we definitely did because everything was delicious. They aren't pushy at all there and make you feel like you are at home. The second stop was El Limon waterfall. You take a horse up to El Limon and then you have to walk. I HIGHLY RECOMMEND getting their boots so you don't get your shoes dirty from mud and horse poo. Some of the guides don't speak English. They are generally nice though but there are a lot of people at El Limon and horseback riding to El Limon. Wear comfortable shoes that won't slip when you walk because you will be doing a lot of walking. Make sure you take some cash to tip the people who walk the horses through the mud as you ride it. El Limon is breathtaking and is the highlight of the trip. The restaurant we went to after was decent but the food could be better. The chicken was good. The rice was okay. The spaghetti was terrible. The location of the restaurant was nice. The waiters there are really attentive. Samana is beautiful. We took a boat from there to Bacardi island which was really nice but we were only there for a short time. Like an hour or so. I wish this was a little longer. The entire tour including pick up and drop off at the hotel was about 16 hours. Again, it is a long long tour but definitely worth it! I would highly recommend it! There is a gentleman who was taking pictures the entire tour. I asked the tour guide how much the pictures were at the beginning of the tour and he said 25 dollars. However, at the end of the tour when I purchased the pictures, the gentleman taking the pictures charged about 35-40 dollars. We didn't know why there was a change but didn't bother asking as we just wanted the pictures and we wanted to relax. It would have been a good tour, but it rained all day and since this is an outdoor tour, it wasn't as enjoyable. I was very surprised to see people taking horses to the waterfall when it was thundering, lightning, and absolutely POURING down rain. I could tell the tour operators were determined to carry out the tour so they didn't lose the money for it, but I'm not sure this is a good idea. I was even more surprised that we got on boat to Cayo Levantado while it was raining. Luckily, it let up a bit, but, again, this was not that enjoyable with the weather we had. I'm surprised they did not cancel or reschedule the tour, but I think it all boils down to money. I know that you can't totally predict the weather, and a passing shower isn't a big deal, but a day of rain and they really should reschedule. Other than that, the tour was well-organized with pick-ups on time and the lunch was pretty good. I would still like to see the waterfall, so maybe someday I'll go back. Cayo Levantado didn't look that great to me compared to Cayo Paraiso which was beautiful, but that could also be because of the weather. I loved this tour so much. The beach/island Cayo Levantado is BREATHTAKING. The clearest of blue waters! Then you have lunch at a local restaurant. Lunch was decent. Then you ride a horse to the El Limon Waterfalls, the most beautiful waterfall I have ever seen they filmed the first scene of the orginal Jurrasic Park in that location. By far my favorite part.